There is a new and innovative knobby tire available for Adventure Riders exclusively from RawHyde; It’s called the Sava MC60. Perhaps you’re wondering why or how RawHyde is getting into the tire business... Well - Here’s the story. This story comes about from pure necessity. As you might imagine we go through a lot of tires at RawHyde. We have nearly 30 bikes in our fleet and tires are one of our largest annual budget items. Over the last few years the only off-road tires we’ve been buying are Continental’s venerable TKC 80,(the most popular knobby in the Adventure market) but the downside of the TKC has been its short service life. Usually the TKC is pretty well worn out after about 2500 miles of use. The TKC is a premium tire & It’s painful to pay $400 dollars for a pair of tires that wear out in 2500 miles, add another $100(in labor) if we have the tires changed at our local dealer and we suddenly have a 500 dollar investment in a very quick wearing product. For several years RawHyde has been looking for an alternative premium knobby with a better wear rating than a TKC and we’ve found one with a Slovenian company named Sava. We met the folks from Sava in Germany last year at the world’s largest motorcycle show. RawHyde had gone there to see the introduction of the new BMW water boxer and during the show we were introduced to the sales manager for Sava by a RawHyde friend who knew we were looking for a way to reduce our tire budget. Coincidentally Sava had just debuted a new tire for the Adventure Bike market at the show and they were looking for an American distributor. We quickly explained our role in the North American “Adventure Market” and Sava sent us several sets of the new tire for testing. To put it simply – we were impressed with the new tire and based on our testing of the new Sava MC60, it should offer the average rider nearly a 40% longer service life (over the TKC). This is due to its unique design and slightly firmer rubber compound. The RawHyde crew has been using the Sava tires for the last 8 months and is finding that the service life ranges from 4500 to 5500 miles. Check out our informational video about our experience. First – where are they made? Savatech, as they are known in Europe, is a Slovenian company that manufactures a full line of tires from heavy truck tires to scooter tires. Sava is a subsidiary of the American company Goodyear tire and they have a state of the art facility in Kranj, Slovenia. If you’re interested in learning more simply Google the phrase “Goodyear Dunlop Sava” and you’ll get lots of information. The Sava MC 60 is a unique tire, with a feature that no other tire has. It’s a true knobby and it’s directional! What does that mean? 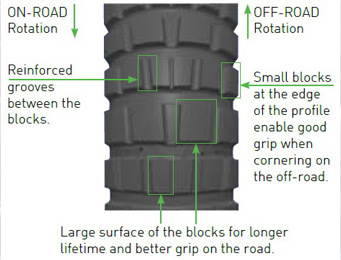 Well – it means that if you are mostly a street rider who wants to occasionally ride off-road these tires have a directional “road rotation” which extends their life if you plan to ride a lot of pavement. 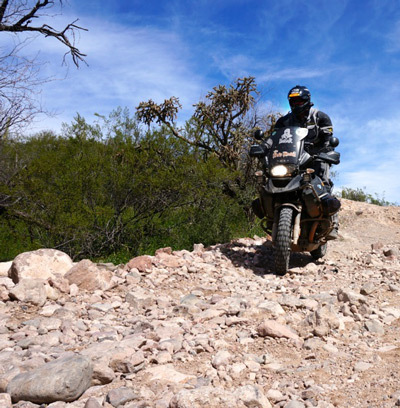 If you plan to ride a lot of dirt and you want maximum traction off-road then you mount the tire so that it rotates in the opposite direction and you’ll have the best possible off-road traction. Sava’s are a great alternative to the TKC 80 – they wear better, are less expensive and are still a premium European tire. Please give them a try!